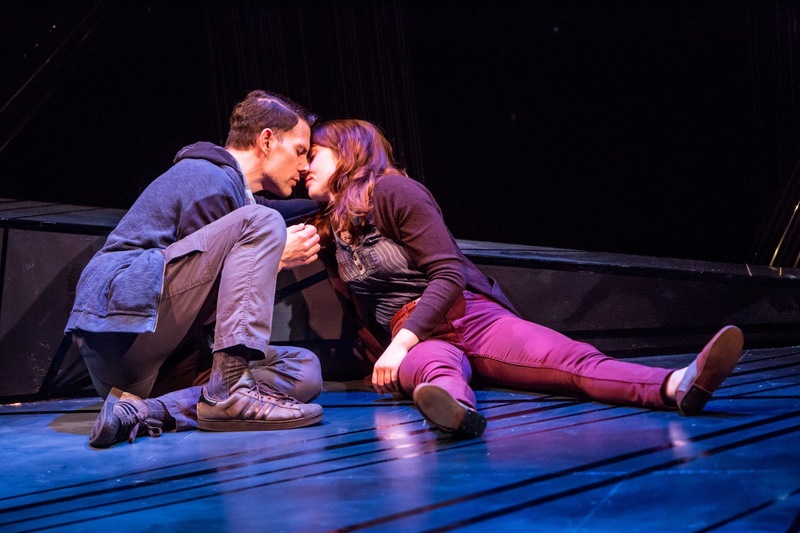 Beekeeping and quantum mechanics mixed with the multiverse - that is what to expect when seeing Constellations at the Jungle Theater. This play is an amazing kaleidoscope of ideas, options, and chances all mixed into a two-person show. Written by Nick Payne, Constellations is about Roland (Ron Menzel) and Marianne (Anna Sundberg) who meet at a barbecue. Roland is a beekeeper while Marianne is a theoretical physicist - a very unlikely combination. There are several attempts at starting a conversation, each time the characters come to an impasse the scene starts again. When the conversation actually continues, the scene continues. In less talented hands this could look like a high school production of the "first date sketch" in which a bell rings each time the date doesn't work out. Lucky for us this incredible cast, under the precise direction of Gary Gisselman, transforms this work into an amazing show about two people and how each interaction changes their lives. Take the opening scene. Each time the characters come to an impasse the scene starts again. However we start to ask ourselves - is it the same characters making another attempt at connecting? Or is it the same characters in a different universe which creates the alternate outcome of the conversation? I felt the play showed multiple versions of events which really highlights how each choice we make affects our lives and the lives of others. The multiverse is the main through line to this show. That is not to say the characters don't have a storyline. It is fascinating and mesmerizing to watch these actors play similar scenes repeatedly but each scene is played slightly differently - either in attitude, or physicality, or small changes in the words. Roland and Marianne (in some universe) meet, date, are in a relationship, break-up (because she cheats multiple times, or he cheats once), meet again at a ballroom class (some very sweet and simple choreography from Myron Johnson), get married, and deal with death. In one universe there is possible abuse, in another there is a brain tumor in the frontal lobe that may or may not lead to assisted suicide. All I can really say is that this show provides a lot to think about while also providing laughs, sighs of romantic joy, tears, and simple wonder. I have already mentioned that the cast and direction were singular and incredible. The other thing that I have to mention is the set by Kate Sutton-Johnson. The directors note states "...a new play whose only stage direction is 'with every change of font there is a change of universe.' And there are sixty changes of font." How do you design for that? Sutton-Johnson found the perfect solution by creating a multi-level set with angles and curves through out. There are lines painted on the set, radiating in various directions. There are also metallic bands set across the top of the set, along the back and sides of the set creating an abstract sculpture for the actors to work on. Occasionally the bands would reflect light into the audience creating a shimmer - reminding us of the multitude of stars (and possible universes) in the sky at night. The program provides more insight into her process, along with some fantastic background to the science of the show, beekeeping, and a list of four books available at Magers & Quinn to further explore the ideas behind the play. I had an amazing, talk-creating experience watching Constellations. It plays through May 29th so there is plenty of time to see it, but if it gets reviews like it did on Broadway, I have a sense that the sooner the better. Spring 2016 Preview - SO. Much. Theater.